Today we couldn't be more pleased to present a brand new acoustic session with our favorite Canadian indie/pop duo, Tegan and Sara! The guys treated us to a stripped down performance of "I'm Not Your Hero" and their amazing new single "Closer". Both tracks are taken from the duo's long-awaited new album "Heartthrob", which drops January 2013. 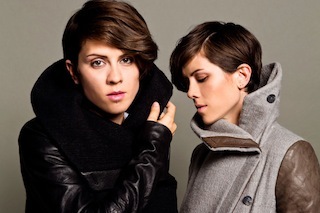 Tegan and Sara's new "In Your Head: An Introduction to Tegan And Sara" EP is out now. Make sure to catch them on tour across North America and the UK with The Killers. All dates and ticket information can be found here.